1. Our #1 question asked, "Does the price include shipping, anchoring and installation?" 2. The second most frequently asked question, "How long before installation?" Usually installed in 4 - 8 weeks. Yes, financing is available. For further financing details and to calculate payments visit this page. a. 1 Year Workmanship Warranty From The Date Of Installation. c. Assuming normal care and maintenance. d. There are no other warranties stated or implied. Standard pin anchors are installed with your carport. If you live in a high wind area mobile home anchors mobile home anchors are recommended instead of standard pin anchors. Mobile home anchors are $25 ea. and typically a minimum of 4 are ordered. Level within 3-4" Out of level 4-12"
1. 36" x 80" Walk-thru doors - Need any? 2. Windows - Need any? 3. Roll-Up Steel Garage Doors - Need any? 2. Any extra panels delivered with your unit (uninstalled)? 3. Any extra tubing delivered with your unit (uninstalled)? 4. Any screws delivered (uninstalled)? Note: No money is exchanged at this time. After clicking submit, you will receive a thank you notification on the following page. Then a staff member will contact you to review your order in detail, normally within 2 business days. After this review, we will prepare your order and either fax, email or mail you a copy of the invoice for you to review and sign. Yes, yes and yes. The specific prices on the preceding page include shipping, anchoring and installation on your level site within our normal service area in the state of Florida. To confirm our service area details visit. 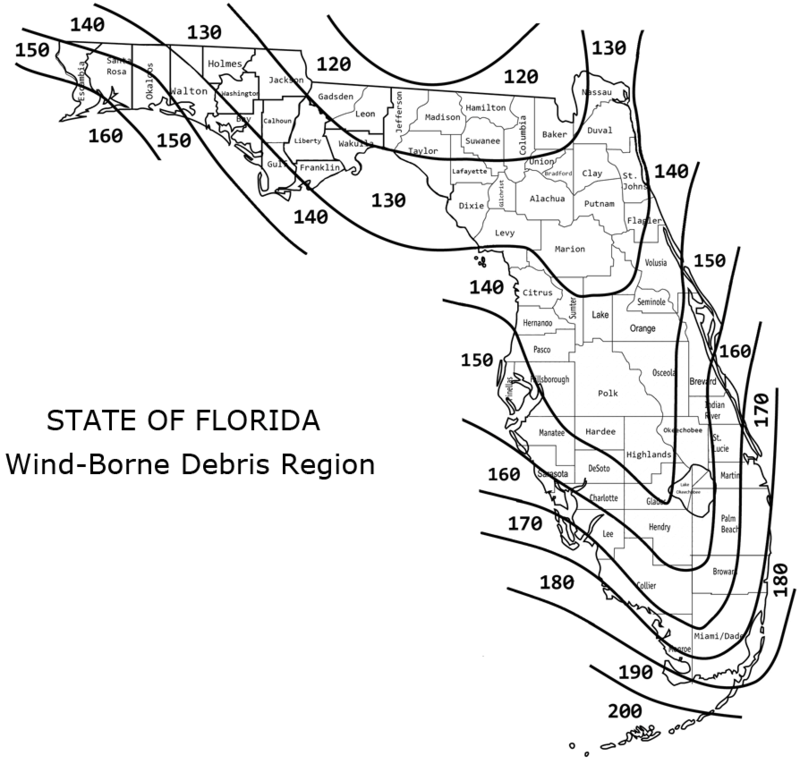 We do not install in these Florida counties - Miami-Dade, Broward or Monroe. Can I have my carport custom sized; I don't see the size I need! Yes. For example you may need a carport that is 21' wide x 23' long. We will make it that size. To determine the cost it would be the exact same cost as the next larger standard size carport. So, for this example it would be the same cost as a 22' wide x 26' long carport. This formula would apply in every circumstance. Does a color choice add to the price? No, you may choose any of our 15 different colors. You may choose one color for the roof, a different color for the trim, a different color for the sides and if a gable end is desired a different color for it at no additional charge. You may also choose to make all of the colors the same on your structure, it's your choice. Can I buy the carport materials and assemble it myself? No. Carports with certified wind loads and snow loads cannot be purchased in kits. Our installation crews must install your carport to meet strict engineering standards. Unless you are purchasing for the federal government, state government, have a farm or agricultural exemption or have a sales tax exemption number and are willing to sign a sales tax exemption form, you have to pay sales tax, or live in a state that is free of sales tax. What factors may add to the cost of the carport? Is there a discount if I purchase more than one? No, there are no quantity discounts. We have 15 different colors to choose from. You may choose one color for the roof, a different color for the trim, a different color for the sides, and if a gable end is desired, a different color for it - at no additional charge. What type of truck is my carport delivered on? The top two pictures show the standard delivery truck and trailer. The 3 member installation team brings the material with them and construction begins immediately upon arrival. 1 Year Workmanship Warranty From The Date Of Installation. Assuming normal care and maintenance. There are no other warranties stated or implied. What is the gauge and size of the metal frame and sheet metal? 14 gauge galvanized steel framing; square measures 2½" x 2½"
12 gauge galvanized steel framing; square measures 2¼" x 2 ¼"
26 gauge steel Max-Rib panels in 15 different colors. What if my ground is not level? Normal installations allow for the ground to be 3-4 inches out of level. If ground is more than 4" out of level we likely will have to trim the legs to fit the contour of the ground. Carports can typically be assembled if ground is out of level from the highest point to the lowest point 4"-9" with additional fees. To determine leveling fee, see item number 9 above under Fees. Carports will not be assembled if the ground is more than 9" out of level from the highest point to the lowest point. What can I do if my ground is more than 9" out of level? You could do what was done here to custom level a site. Do you make carports longer than what is on your price list? We'll make carports as long as you need. You may depending on your local zoning regulations or rural location. What if I want to enclose the whole carport and make a garage? We invite you to view our metal garages. What if I want to just get a carport now, and later on have installers come back and put sides on to make a garage? Is that possible? Yes that is no problem. There would just be an additional return trip fee plus the cost of the options you were having installed at a later date. How tall does this need to be to cover my motor home? The number one mistake people make is they get them too tall for RV's. If you were in the pouring rain with an umbrella in your hand, would you hold the umbrella as high as you could or hold it down close to your head for added protection from the elements?… Even the tallest RV's on the market today are 12'6" tall to the top of the A/C. Can it be attached to my home/garage/other structure? No, we will not attach. Factory trained installation teams deliver the materials and assemble the carport immediately upon arrival in your area. I have other questions or concerns. How can I talk to someone? Visit the common law of business page for an interesting viewpoint regarding pricing. Can you install on a boat dock? We will only install on a stationary dock. We will not under any circumstances install a carport on a floating boat dock. Further, we must be able to back a truck and trailer up to the boat dock without carrying materials over 50 feet or up/down steps. Installation on a boat dock will assess additional fees. See item number 9 above for additional fee. Do you provide rain gutters? What width carport is good for 2 cars? Most people prefer a carport width of at least 20' wide for 2 cars, although some report that 18' wide is sufficient. How is my carport assembled? Remove anything out of the way that would impede the progress of the installation. Clearly mark the four corners of the carport location and level the spot if necessary. How many braces are included? All carports come standard with peak braces and a minimum of 4 corner braces. What is the difference between 14 and 12 gauge framing? Both are galvanized steel. However, the wall thickness of the 12 gauge framing is 3 hundredths of an inch thicker. 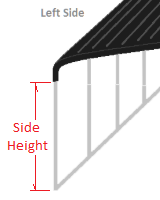 What is the roof pitch on my carport? For regular style carports the roof pitch is approximately 3:12. For box eave style carports the roof pitch is approximately 4:12. For 12' to 24' wide carports the post are spaced no more than every 5' apart. For 26' to 30' wide carports the post are spaced no more than every 3'6". Can I have a carport installed on a wood floor or deck? Yes, carports can be installed on wood surfaces, floors or decks. However, when installed on wood surfaces, floors or decks they cannot maintain the engineer certified wind and snow load ratings. To qualify for the wind and snow load ratings the engineer offers three surfaces to anchor to. The engineer offers the following three choices to mount to and maintain wind and snow load ratings - anchored to the (1) ground/gravel, (2) concrete slabs with footings built to the engineer/county specifications or (3) asphalt. This means that in order for carports to have wind and snow load ratings they cannot be built on retaining walls, concrete retaining walls, wood surfaces, wood decks, wood platforms, concrete platforms, rooftops, etc. Is the Box Eve style or the Regular style stronger? There is no difference in strength. Carports can take anywhere from 1 - 8 hours to assemble depending on the options that were ordered. How tall will my gable end be? The bottom of the gable end is typically the same height as the legs. How close can I put this carport to another structure, building or fence? There is no hard and fast rule. However, keep in mind that there will have to be enough room for the installers to attach the sheet metal to the sides with their screw guns and set their ladders for taller structures. If I order a side panel, how far down the side will it go, or how much coverage would I expect? Side panels will come down 3' (three feet). So if you order one side panel, you will have three feet of coverage. If you order two side panels, you will have six feet of coverage. Three panels would equal nine feet of coverage. How is my carport anchored to my concrete slab? Holes are drilled into your concrete slab. Then wedge anchors are inserted through pre-drilled holes in the base rail of your carport into the holes in the concrete and securely fastened. Is a footer required for the installation of a carport? The engineer for your state specifies a footer similar to this on the engineering prints. However, some local zoning officials have approved installation of carports on 4" slabs; consult with your local zoning department for clarification to meet local zoning department requirements. How is my carport anchored to asphalt? A small hole is made in your asphalt for helix or mobile home anchors to be inserted into the ground. Then the carport base rails are bolted to the mobile home anchors for a secure hold. Additional fees apply, see question number 9 above. How is my carport anchored to the ground or dirt? Carports with certified wind and snow load ratings are anchored to the ground. We install into the ground next to the base rails of the carport mobile home or helix anchors. Once these anchors are screwed into the ground they are then bolted to the base rail of the carport for a secure hold per the engineers specifications. How is my carport anchored to a wood deck or other wood surface? Lag bolts are inserted through pre-drilled holes in the carport base rails and screwed into the wood surface for a secure hold. Please note however, that carports installed on a wood surface, can no longer be certified for with a wind and snow load rating. We are aware that some customers are quite creative and add anchor bolts and structural reinforcement after we anchor the base rail to the deck although no wind rating can be provided. What are the financial terms to purchase? 16% deposit usually paid with a credit card or check is required. Balance due after your carport is installed. Purchase order is acceptable with approval and should be faxed to us at: 770-942-4655. All purchases require a 16% deposit. There is a $25 fee for orders cancelled within 7 days after submission. The balance of the deposit will be refunded. After 7 days, the structure will be in production and deposits are not refundable. Personal or business check, debit or credit card - Visa, American Express, Mastercard, Discover, cash, money order, financing is available with approved credit or a Purchase Order with prior approval from the accounts receivable department at G.P.B., Inc. Fill out the secure order form and submit. After clicking submit, you will receive a confirmation number at the very top of the following page. Then a staff member will contact you to review your order in detail, normally within 2 business days. After this review, we will prepare your order and either fax, email or mail you a copy of the invoice for you to review and sign. Once we receive your signed invoice, the scheduling department will contact you approximately 2-6 days prior to installation. We will not just show up to install your carport. You will get a call to schedule the installation. Yes, yes and yes. The specific prices on the preceding page include shipping, anchoring and installation on your level site within our normal service area in the state of California, Nevada and Arizona. To confirm our service area details visit. We do not install or deliver outside of normal service area. Usually installed in 3-6 weeks. No, you may choose any of our 18 different colors. You may choose one color for the roof, a different color for the trim, a different color for the sides and if a gable end is desired a different color for it at no additional charge. You may also choose to make all of the colors the same on your structure, it's your choice. Electronic copies of engineering prints are included in the cost of your engineered carport on the previous page. However, if your local zoning department/permit office requires original prints (will not accept copies) an additional fee of $250 will apply for prints with wet seal mailed first class. As-built/site-specific engineering prints, occasionally required for commercial sites can cost from $325 - $1500. We have 18 different colors. to choose from. You may choose one color for the roof, a different color for the trim, a different color for the sides, and if a gable end is desired, a different color for it - at no additional charge. 14 gauge carports come with a 30 day workmanship warranty. assuming normal care and maintenance and the 30 day workmanship warranty. 29 gauge steel Max-Rib panels in 15 different colors. What is the wind load and snow load of these carports? All carports on previous page are designed according to the 2012 building code. They have a seismic design category of 'E'. All carport prices on previous page have a wind load rating of 110 mph and 20 psf snow load rating. The roof pitch is approximately 3:12. Holes are drilled into your concrete slab. Then wedge anchors are inserted through pre-drilled holes in the base rail of your carport into the holes in the concrete and securely fastened for a secure hold. 32" long anchors are inserted through pre-drilled holes in the base rail. A small hole is made in your asphalt and the anchor is driven into the ground with a sledge hammer under the asphalt. Helix or mobile anchors are inserted into the ground and bolted to the base rails of your carport. Lag bolts are inserted through pre-drilled holes in the carport base rails and screwed into the wood surface for a secure hold. Please note however, that carports installed on a wood surface, can no longer certified for a specific wind and snow load rating. We are aware that some customers are quite creative and add anchor bolts and structural reinforcement after we anchor the base rail to the deck. 12% deposit usually paid with a credit card or check is required. Balance due after your carport is installed. Purchase order is acceptable with approval and should be faxed to us at: 770-942-4655. All purchases require a 12% deposit. There is a $25 fee for orders cancelled within 7 days after submission. The balance of the deposit will be refunded. After 7 days, the structure will be in production and deposits are not refundable. Yes, yes and yes. The specific prices on the preceding page include shipping, anchoring and installation on your level site. Electronic photocopies of engineering prints are included in the cost of your engineered carport on the previous page. However, if your local zoning department/permit office requires original prints (will not accept copies) an additional fee of $265 will apply for prints with wet seal mailed first class. As-built/site-specific engineering prints, occasionally required for commercial sites can cost from $325 - $700. 29 gauge steel R-panels in 15 different colors. For 12′ to 24′ wide carports the post are spaced no more than every 5′ apart. For 26′ to 30′ wide carports the post are spaced no more than every 3′6". Lag bolts are inserted through pre-drilled holes in the carport base rails and screwed into the wood surface for a secure hold. Lag bolts are inserted through pre-drilled holes in the carport base rails and screwed into the wood surface for a secure hold. Please note however, that carports installed on a wood surface, can no longer be certified with a wind and snow load rating. We are aware that some customers are quite creative and add anchor bolts and structural reinforcement after we anchor the base rail to the deck although no wind rating can be provided. 16% deposit on the carport is due when placing an order. The balance is due after your carport is installed. Purchase order is acceptable with prior approval. Yes. Deduct 5% from the prices quoted on preceding pages. All materials will be delivered to your home. You cannot pick up materials under any circumstances. No assembly instructions are provided. This is your choice if you decide to purchase and assemble yourself (not our recommendation). 32" long anchors are inserted through pre-drilled holes in the base rail. The anchors are driven into the ground with a sledge hammer for a secure hold. We offer as an option for installations in high wind areas for carports installed on the ground mobile home or helix anchors that are screwed into the ground and bolted to the base rails at a price of $50 each. Yes, yes, yes and yes. The specific prices on the preceding page includes engineering print photocopies, shipping, anchoring and installation on your level site. It should be noted that we do not install in New York City, Manhattan, Brooklyn, Staten Island or Long Island. To confirm service area details visit our service area map. Can I have this installed on a wood floor or deck? Lag bolts are inserted through pre-drilled holes in the carport base rails and screwed down into the wood surface for a secure hold. Yes, yes and yes. The specific prices on the preceding page include shipping, anchoring and installation on your level site in the states of Alabama, Arkansas, Georgia, Illinois, Iowa (south of I-80), Kansas (east of Great Bend), Kentucky, Louisiana, Mississippi, Missouri, Southeast Nebraska, North Carolina, Oklahoma (except panhandle), South Carolina, Tennessee, Texas, West Virginia and Virginia. What if I want a 24′ x 25′ garage with 14 gauge framing, two 9′ wide x 7′ high roll-up doors in the 24′ wide end wall, 1 walk-thru door and 1 window? Select a 24′ x 25′ x 8′ leg height garage with 14 gauge base price + one 9′ x 7′ roll-up door + one 9′ x 7′ roll up door + 1 walk-thru door and 1 window. What if I want an 18′ x 20′ garage with 12 gauge framing, one 10′ wide x 8′ high roll-up door in the 18′ wide end wall and 1 window? Select an 18′ x 20′ x 9′ leg height garage with 12 gauge base price + one 10′ x 8′ roll-up door + 1 window. What if I want a 30′ x 60′ garage with 12 gauge framing, three 10′ wide x 10′ high roll-up doors in the 60′ long side wall, 2 walk-thru doors and 4 windows? Select a 30′ x 60′ x 12′ leg height garage with 12 gauge base price + one 10′ x 10′ roll-up door located in the side + one 10′ x 10′ roll-up door located in the side + 1 walk-thru door + 1 walk thru door + 4 windows. What if I want a 22′ x 30′ garage with 14 gauge framing, two10′ wide x 8′ high roll-up doors in the 30′ long side wall, 1 walk-thru door and 1 window? Select a 22′ x 30′ x 10′ leg height garage with 14 gauge base price + one 10′ x 8′ roll-up door in the side + one 10′ x 8′ roll-up door in the side + 1 walk-thru door + 1 window. Can I have my garage custom sized; I don't see the size I need! Yes. For example you may need a garage that is 21′ wide x 23′ long. We will make it that size. To determine the cost - it would be the exact same cost as the next larger standard size garage. So, for this example it would be the same cost as a 22′ wide x 25′ long garage. This formula would apply in every circumstance. Can I buy the garage materials and assemble it myself? No. Garages with certified wind loads cannot be purchased in kits. Our installation crews must install your garage to meet strict engineering standards. What factors may add to the cost of the garage? We have 15 different colors to choose from. You may choose one color for the roof, a different color for the trim & a different color for the sides - at no additional charge. What type of truck is my garage delivered on? Normal installations allow for the ground to be 3-4 inches out of level. Do you make garages longer than what is on your price list? We'll make garages as long as you need. You may depending on your local zoning regulations. Factory trained installation teams deliver the materials and assemble the garage immediately upon arrival in your area. No, we offer no rain gutters. What width garage is good for 2 cars? Most people prefer a garage width of at least 22′ wide for 2 cars, although some report that 20′ wide is sufficient. Do you offer insulation for the garages or workshops? We can install double-bubble insulation in the units that we build. The price is $1.00 per square foot (of side-wall, end-wall, and roof square footage). It has an R-Value of 4.3. To determine the cost visit here.. NOTE: Perimeter sealing at the foundation, if necessary, is the responsibility of purchaser. How is my garage assembled? View the metal garage construction process. Remove anything out of the way that would impede the progress of the installation. Clearly mark the four corners of the garage location and level the spot if necessary. How many braces are included on my garage? All garages with 8′ legs or higher come standard with a minimum of 5 peak braces and a brace at every leg where possible. What is the roof pitch on my garage and can this be changed? The roof pitch is approximately 3:12 and it cannot be changed. For 12′ to 24′ wide garages the post are spaced no more than every 5′ apart. For 26′ to 30′ wide garages the post are spaced no more than every 3′ 6”. No, because we would no longer be able to maintain the wind load rating of 140 mph. Garages can take anywhere from 1 - 2 days to assemble, depending on the options that were ordered and the size of the garage. How close can I put this garage to another structure, building or fence? What leg height should I have on my garage? Although, there are exceptions, the rule of thumb is, if the garage doors are to be placed in the end (width) of the garage the leg height must be 1′ taller than the height of the garage door(s). If the garage door is to be placed in the side wall (length) of the garage, the leg height of the garage needs to be 2′ taller than the height of the garage door(s). (i.e. 24′ wide x 40′ long x 9′ leg height with two 9′ wide x 7′ high roll-up doors placed in the 40′ side wall. Result is 2′ higher leg height of garage than the height of the garage door). What size should I pour the slab? Pour slab the same size as your garage footprint. As an example for a 24′ x 40′ garage a slab should be a minimum of 24′ wide x 40′ long. View a coil type door. They work great but electric garage doors do not work with these. In situations where an electric garage door opener is required we recommend that you let us build the garage door with framed in openings that will accommodate the garage door(s) size of your choice. After your garage is completed you or a local garage door contractor can install a sectional raised panel garage door that an electric garage door opener will work with. Why is the vertical style roof so highly recommended for a garage? A vertical style roof is far superior. Why is it superior? A vertical style roof is far less prone to leak. The roof does not hold water, leaves, pine straw and other debris. It also has a natural ridge vent and a more pleasing appearance. Wherever you buy, insist on the vertical style roof. How is my garage anchored to my concrete slab? Holes are drilled into your concrete slab. Then wedge anchors are inserted through pre-drilled holes in the base rail of your garage into the holes in the concrete and securely fastened. Should I put anchoring bolts in the slab while I am pouring the slab to make the installation easier? That way they can just put the garage base rails right over my anchor bolts and not have to drill. Absolutely not. The base rails are pre-drilled during manufacturing and will never line up where you place your bolts. These structures are engineered to have the bolts at specific locations. Therefore, please allow us to drill our own holes in your existing slab where we need them. How is my garage anchored to asphalt? How is my garage anchored to the ground or dirt? A 16% deposit is due when placing an order. The balance is due after your garage is installed. Purchase order is acceptable with prior approval. After clicking submit, you will receive a confirmation number at the very top of the following page. Then a staff member will contact you to review your order in detail, normally within 2 business days. After this review, we will prepare your order and either fax, email or mail you a copy of the invoice for you to review and sign. Once we receive your signed invoice, the scheduling department will contact you approximately 2-6 days prior to installation. We will not just show up to install your garage. You will get a call to schedule the installation. Yes, yes, yes and yes. The specific prices on the preceding page include engineering print photocopies, shipping, anchoring and installation on your level site in the states of Alabama, Arkansas, Georgia, Illinois, Iowa (south of I-80), Kansas (east of Great Bend), Kentucky, Louisiana, Mississippi, Missouri, Southeast Nebraska, North Carolina, Oklahoma (except panhandle), South Carolina, Tennessee, Texas, West Virginia and Virginia. Photocopies of engineering prints are included in the cost of your engineered garage on the previous page. However, if your local zoning department/permit office requires original prints (will not accept copies) an additional fee of $265 will apply for prints with wet seal mailed first class. As-built/site-specific engineering prints, occasionally required for commercial sites can cost from $325 - $700. Do the engineering prints show the foundation footer detail? Who is responsible for acquiring a building permit? The purchaser of the garage is responsible for going to the permit office and for any permit fees. Upon ordering your garage from G.P.B., Inc. you will receive engineering print photocopies to take down to your local permit office to acquire a permit with. Yes, garages can be installed on wood surfaces, floors or decks. However, when installed on wood surfaces, floors or decks they cannot maintain the engineer certified wind and snow load ratings. To qualify for the wind and snow load ratings the engineer offers three surfaces to anchor to. The engineer offers the following three choices to mount to and maintain wind and snow load ratings - anchored to the (1) ground/gravel (2) concrete slabs with footings built to the engineer/county specifications or (3) asphalt. This means that in order for garages to have wind and snow load ratings they cannot be built on retaining walls, concrete retaining walls, wood surfaces, wood decks, wood platforms, concrete platforms, rooftops, etc. Garages take approximately 2 days to assemble, depending on the options that were ordered and the size of the garage. What type of footer is required for this garage? Notice this illustration of a sample concrete footer. A hole is made in your asphalt for helix or mobile anchors to be inserted into the ground. Then the garage base rails are bolted to the mobile home anchors for a secure hold. Additional fees apply, see question number 9 above. Helix or mobile home anchors are inserted into the ground and bolted to the base rails of your garage. Yes, yes, yes and yes. The specific prices on the preceding page include shipping, anchoring and installation on your level site in the state of Florida. Normal service area in Florida includes the entire state except for the Florida Keys. 26 gauge steel R-panels in 15 different colors. We can install double-bubble insulation in the units that we build. The price is $1.00 per square foot (of side-wall, end-wall, and roof square footage). It has an R-Value of 4.3. To determine the cost visit here. What if I determine that a building permit is required for my garage? The purchaser of the garage is responsible for going to the permit office and for any permit fees. You will need to notify us immediately so that Florida engineering prints can be sent to you. The cost of these standard engineering prints is a non-refundable $140. Pour slab 3/4" wider in width and the same length. As an example for a 24′ x 40′ garage a slab should be a minimum of 24′ 3/4” x 40′ long. A 12% deposit and the cost of the engineering prints which are included in the pricing on the previous page is due when placing an order. The balance is due after your garage is installed. Purchase order is acceptable with prior approval. Yes, yes, yes and yes. The specific prices on the preceding page include engineering print photocopies, shipping, anchoring and installation on your level site in the states of Pennsylvania, Ohio, Indiana, Maryland, New York and New Jersey. It should be noted that we do not install in New York City, Manhattan, Brooklyn, Staten Island or Long Island. To confirm service area details visit our service area map. Electronic copies of engineering prints are included in the cost of your engineered garage on the previous page. However, if your local zoning department/permit office requires original prints (will not accept copies) an additional fee of $265 will apply for prints with wet seal mailed first class. As-built/site-specific engineering prints, occasionally required for commercial sites can cost from $325 - $700. Yes, yes, yes and yes. The specific prices on the preceding page include shipping, anchoring and installation on your level site within our normal service area in the state of California, Nevada and Arizona. To confirm our service area details visit. We do not install or deliver outside of normal service area. We have 18 different colors to choose from. You may choose one color for the roof, a different color for the trim & a different color for the sides - at no additional charge. 14 gauge garages come with a 30 day workmanship warranty. NOTE: Perimeter sealing at the foundation, if necessary, is the responsibility of the purchaser. Yes, garages can be installed on wood surfaces, floors or decks. However, when installed on wood surfaces, floors or decks they cannot maintain the engineer certified wind and snow load ratings. To qualify for the wind and snow load ratings the engineer offers three surfaces to anchor to. The engineer offers the following three choices to mount to and maintain wind and snow load ratings - anchored to the (1) ground/gravel, (2) concrete slabs with footings built to the engineer/county specifications or (3) asphalt. This means that in order for carports to have wind and snow load ratings they cannot be built on retaining walls, concrete retaining walls, wood surfaces, wood decks, wood platforms, concrete platforms, rooftops, etc. Pour slab 6" wider in width and 6" longer in length. As an example for a 24′ x 40′ garage a slab should be a minimum of 24′ 6" wide x 40′ 6 long. A 12% deposit is due when placing an order. The balance is due after your garage is installed. Purchase order is acceptable with prior approval. When will site be ready for installation? © G.P.B.,Inc. 2019 All Rights Reserved.